Auto service shops and warehouses are often great candidates for upgrading space heating, insulation and water heating, and there are hundreds of locations in Oregon and Southwest Washington that can benefit. Energy-efficient upgrades can improve comfort for customers and employees while saving energy and money on their utility bills. Trade allies and vendors play a key role in helping customers choose efficient options while making them aware of incentives from Energy Trust of Oregon. 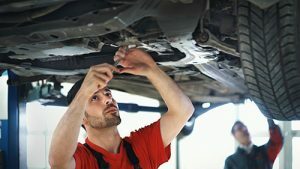 Warehouses, car dealerships, auto repair shops and other auto service businesses often heat with older, inefficient HVAC unit heaters suspended from the ceiling, which may not effectively reach customers and workers. Energy Trust provides standard incentives to replace unit heaters with more efficient and effective heating options, including efficient gas unit heaters. Gas-fired infrared (IR) radiant heaters that directly warms the space’s occupants, rather than warming the air, are another option. Incentives for IR heaters are available when replacing non-radiant heating like HVAC unit heaters or electric resistance heating. Auto shops and warehouses can also make their spaces more energy efficient and comfortable by adding insulation. Energy Trust also offers insulation incentives for improving insulation levels in roofs, walls or attics. Incentive amounts are based on where insulation is needed, along with current and ending R-value efficiency ratings. Water heater upgrades are another way to save. Auto service shops and warehouses often use older tank water heaters to meet their needs. Energy Trust offers incentives for upgrading tank water heaters to efficient condensing tank water heaters with a minimum of 91 percent thermal efficiency. For more information about incentives for heating, insulation and water heating, contact Rob Hall, account manager, at 503.413.9168.